The first day of 2013 surely brought us a plethora of leaked images of upcoming phones. After we saw Sony's Xperia Z and ZL, now it's Huawei's turn. We encountered the Ascend Mate phablet numerous times before - on leaked info, photos, even a Huawei Chairman showed the thing at a Huawei retail store in China. Today, just a few days before the official announcement at CES, a new press shot made its way on the internet. 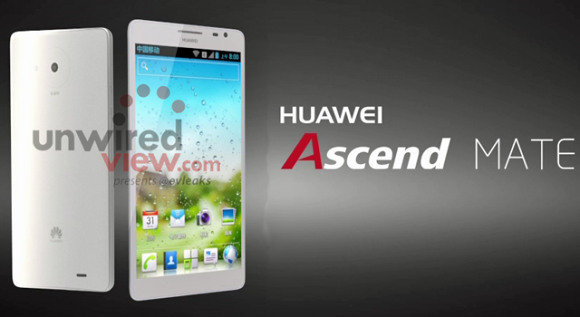 But the leaked images doesn’t stop with the Ascend Mate. The quietly announced Ascend D2 also got a higher resolution photo, where we can spot Huawei's Emotion UI in greater detail than before. Just like Mate, D2 will also get its official debut at CES. Finally, Huawei's Windows Phone 8 gadget, the W1, got to show its four different colors. The W1 will be the third smartphone that Huawei will unveil at CES.